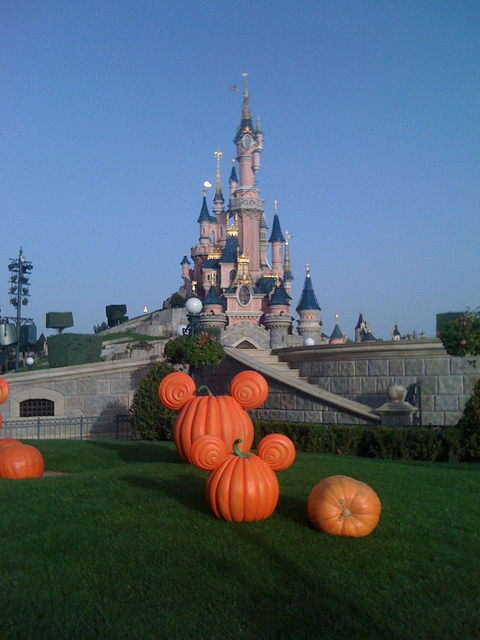 Here I was, Disneyland Paris. Park #3 on my bucket list. Walking up to the hotel was very exciting. 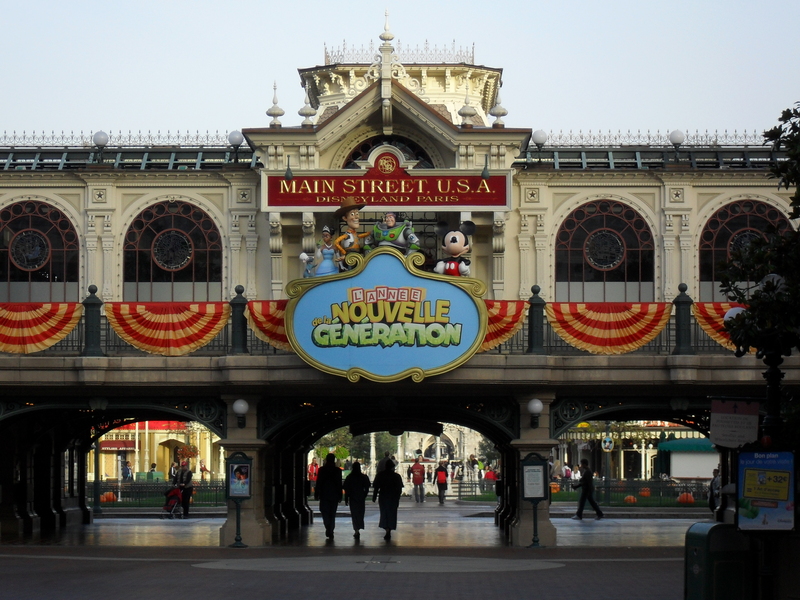 The Entrance to Disneyland in Paris looks nothing like it’s sister parks in the United States. The big reveal takes a while. Through the ticket booth, up to the turnstile and across an open walkway and finally you are at the tunnel. The Tunnel is in the sister parks too. The train travels over head. In the other parks I went to there is only two choices, left tunnel or right tunnel with a sign over hear that reads : Here you leave today and enter a world of Yesterday, Tomorrow and Fantasy. I looked for a similar sign and could find it. It must have one. 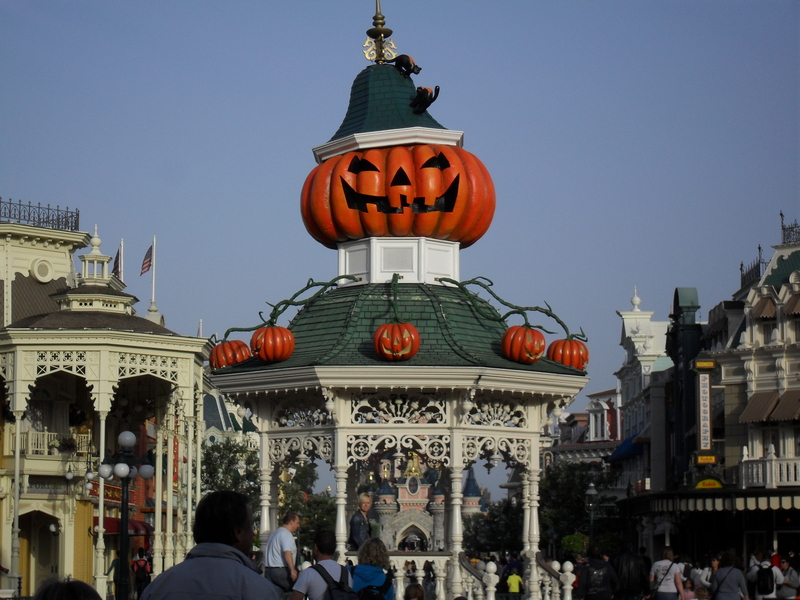 That was the first thing I noticed was different, that and THREE tunnels to choose from.When we travel to the parks, we take turns deciding which tunnel to go through. I prefer entering the park on the right and leaving on the left. Here in Paris, we threw caution to the wind and went in the center tunnel! Crazy and shocking, I know! Thrilling none the same. My fist glimpse of Main Street, There was a gazebo where the American Flag stands in the States. I understand why the flag was not there. 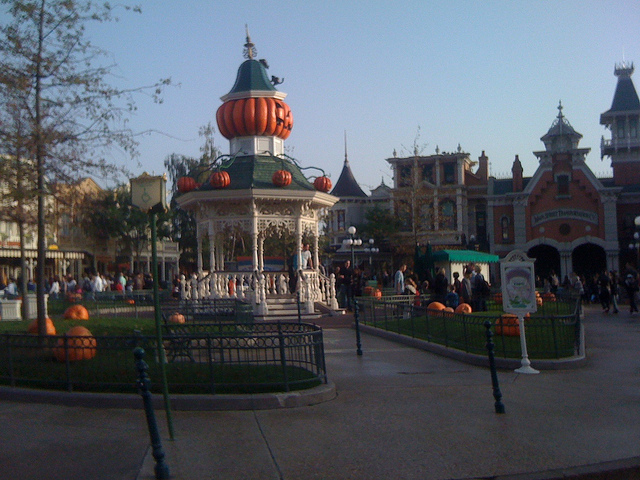 The Gazebo was charming all dolled up for Halloween. I looked for the Fire Hall… To my extreme disappointment, there was a store in it’s place. There was no apartment overhead, no light in the window, no sign of Walt Disney. Maybe that is why the spark was not the same. I sent the muppets off to get photos with Characters before the rope drop (park opening), while I went to City Hall to make dinner reservations. By the time I found them, they were disheveled and flustered because here in Paris, guests do not queue up for pictures and autographs. They channel their inner hockey players, hoist their elbows up and force their way to the front. For a couple of Canadian muppets, this concept felt rude and unappealing. No autographs this trip. Secretly I was relieved, this meant more time for rides and details! YAY! Score one for the mom! As we walked closer towards Main Street, I noticed the Castle drawing me in. She was beautiful and more spectacular than the other two castles I have loved before. It was hard for me to pull my eyes away and discover the details that surrounded me on Main Street. 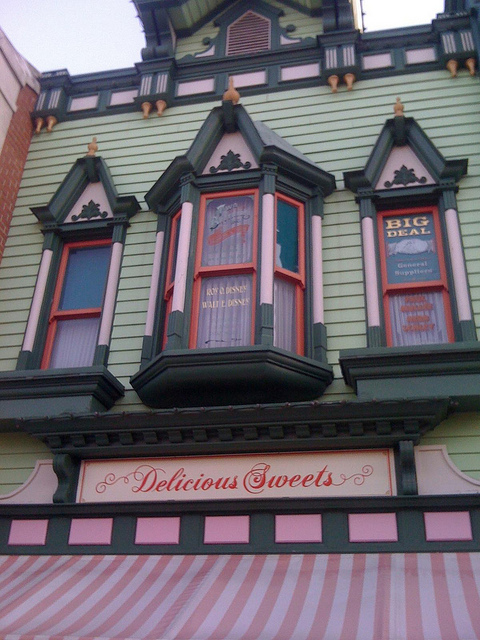 Windows on Main Street traditionally are painted with names of Disney builders, and imagineers, these windows did not disappoint. Except they are sparse in comparison. 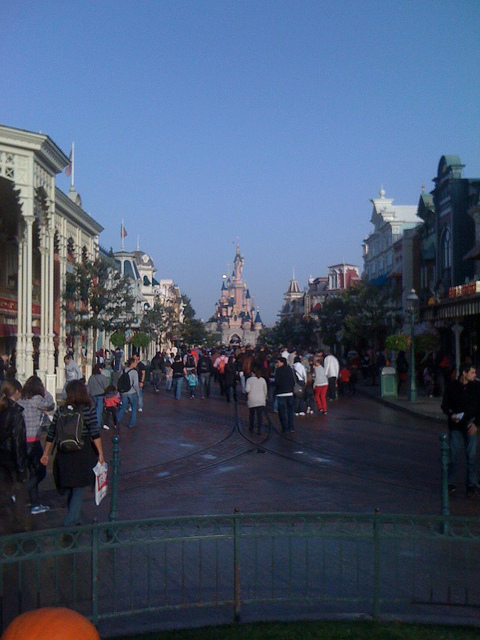 The street is wide and gives you that “walking down the red carpet” feeling Walt had wanted for the other two parks. By this time I was so excited to get to the castle I could barely contain myself! I wanted to see the Partners Statue and compare it to the others. 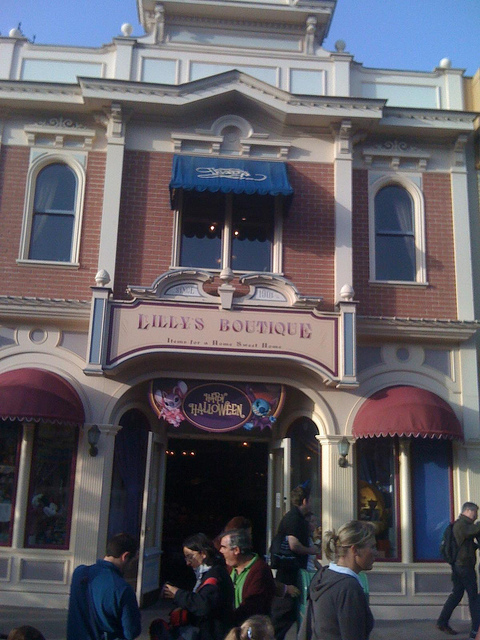 We passed Casey’s Corner, and Gibson Girls Ice Cream Parlor, saw a shop that gave a nod to Lilly Disney – that thrilled me. All I could think was, I am walking right down Main Street in Paris with my family, Luck me! Off we went to find the rope and join the masses for rope drop. We reached the “hub” and noticed no Partners Statue! WHAT THE…? 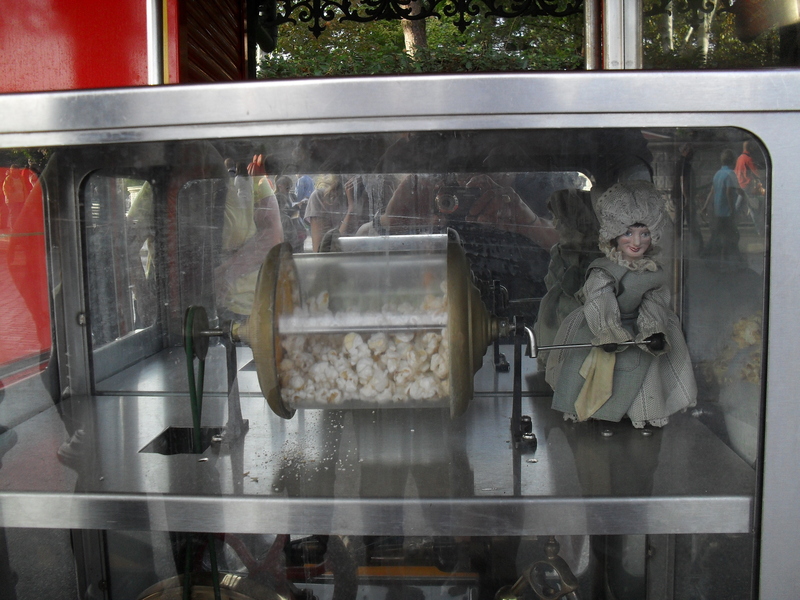 It was later when I discovered it was at the Studios, a separate park – WRONG WRONG WRONG! 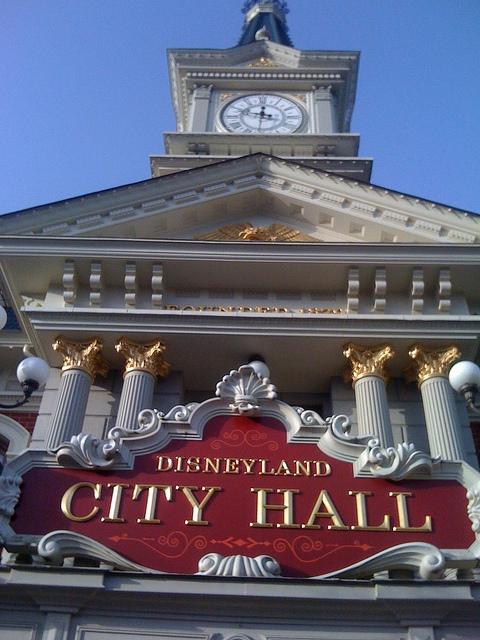 But WHATEVER, it’s not my park, I understand you can put it wherever you like Michael Eisner, maybe that is why you don’t work there any more….poor decisions. The Castle up close and personal, amazed me with the scope and grandeur. I fell in love with my 3rd Castle. Although I think she is my favorite. We had time to listen to the Main Street Loop music that is piped in. It really adds to the magical feeling in the park. Listening and singing while we waited in Frontierland for the rope to drop and our brand new Disney Adventure to begin! Great description and pictures. I feel I am walking in there with you. I don’t like the butting in for pictures and autographs. That is very rude to me. So, is it anything like the American version, where Le Hamburger costs Le Arm And Le Leg?? Love the pictures! So awesome! I loved reading your posts about Disneyland. I went there when I was really young and my father was stationed overseas. I don’t remember everything about it, but your pictures have been a really nice reminder. I do, however, remember my absolute awe over that castle. It is just soooo pretty! And I remembered buying little dalmations for 101 Dalmation glass knick nacks–I still have them somewhere. I should find them and put them on display – they were so cute! Thanks for sharing – seems like it was fun!